This artist's rendering shows an astronaut's-eye view of the lunar navigation system that Ohio State University researchers and their colleagues are developing. Future moonwalkers could become high-tech surveyors whoselunar navigation system gets updated on the fly. NASA-backed researchers envision a combination ofmotion-based sensors, surface cameras and orbiter maps to help Constellationastronauts returning to the moon in 2020. "We will have cameras on the lander, cameras on thevehicle, and even on the shoulder, helmet or belly of the astronaut," saidRon Li, a civil engineer at Ohio State University. Li previously designed navigation system upgrades for NASA?sSpirit and Opportunity rovers currently making their way across Mars. Now hehas $1.2 million from NASA and collaborators at Massachusetts Institute ofTechnology and the University of California-Berkeley to make the LunarAstronaut Spatial Orientation and Information System (LAOIS)a reality within three years. LAOIS will start with 3-D maps of the lunar surfacecreated from orbital views taken by probes such as the future LunarReconnaissance Orbiter. Such maps provide the basic topography of the lunarlandscape and landmarks such as craters. The system gets updated as soon as NASA's Orionspacecraft arrives and its Altair lunar lander begins the descent to the moon?ssurface, with cameras figuratively clicking all the way down. The new images ofthe landing area will then feed into the navigation system. "According to our Mars work, during landing youmight get descent pictures that give you gradually a higher resolution of theplaces on the surface," Li told SPACE.com. Video feeds from astronaut and vehicle cameras would alsoadd to the flow of information. Both the astronauts and their vehicles willalso carry motion sensors that constantly update the navigation system withtheir location — moonwalkers may even sport pedometers similar to those worn byrunners. 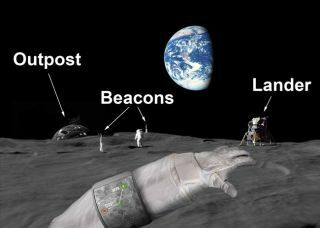 A lunar communication system consisting of beacons couldalso help pinpoint the location of astronauts and vehicles for LAOIS. Navigation tools such as these should help theConstellation astronauts avoid the confusion reported by some Apollomoonwalkers, who had difficulty eyeballing distance and size on the lunarsurface without familiar visual benchmarks such as buildings or streets. "When they land, they kind of lose the sense oforientation, size and shape of objects," Li said. "Usually youoverestimate size on the lunar surface." Getting into the mindset of astronauts requires more thanjust knowing engineering. Li's interdisciplinary team will examine how best tocommunicate information to the astronauts from a "cognitive science pointof view," and hopefully prevent problems of disorientation. The system will get its true test within three years,when Li's team will take it out for a test run in the Mojave Desert. Asuccessful demonstration could lead to a flight-ready version gettingdeveloped. LAOIS seems to represent the best immediate solution formoonwalkers, given that the moon lacks the fleet of satellites that makeEarth's Global Positioning System (GPS) possible. NASA or other space agenciesmay eventually launch additional communicationand navigation satellites to the moon, but until then astronauts will findtheir way one step at a time.